With its parallel design, the lovely flowers reflect upon one another. This contemporary look is a perfect match for that stylish, special someone. 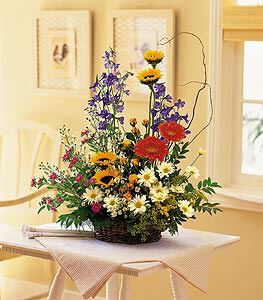 Sunflowers, delphinium, gerberas, daisies and roses lavishly arranged in a dark wicker basket.